This program focuses on predatory lending and marketing practices within the financial industry including credit card marketing, rent-to-own ploys, and payday and title loans. Students will learn to think critically about media’s messages about money and credit, as well as about their own financial decisions. * a 38-minute video on college students and credit cards, payday loans, title loans, and rent-to-own. 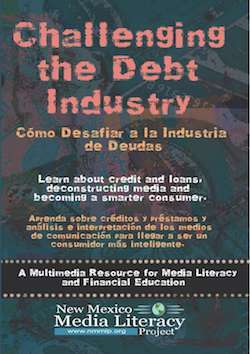 * Over sixty media examples on credit cards, loans, and consumerism. * Lesson plans, guides, handouts, and a printable discussion guide for each video chapter. * Spanish version of the video, DVD menus, classroom resources and several media examples.